A picture of the Friends' Meeting House, rear, 26,Caunce Street, Blackpool c1930, and the proposed new building on Raikes Parade. The original Meeting House was in a room reached via a side door in a back street behind J.Bamber's fish & chip shop (just before the washing line!). 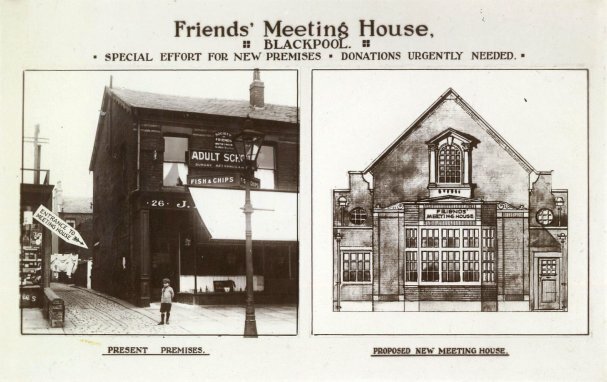 The new Meeting House was opened in Raikes Parade by the end of 1932, built to a slightly different design. Site of the original Meeting House, Caunce Street, photographed in 2009.